Many countries continue to implement emission trading schemes in an effort to limit both the release of harmful levels of carbon dioxide into the atmosphere and its subsequent absorption into the oceans causing acidification. This adoption trend would address market failure naturally in any economy that does not prevent harmful emissions. The European Union’s Emissions Trading Scheme (EU-ETS) is the largest greenhouse gas trading system to date. The objective of this study is to analyze the general economic effects of EU-ETS, particularly in two areas for evaluation: (1) environmental effectiveness measured through emissions reduction; (2) economic efficiency measured through price effects. A central conclusion is that the absence of elasticity in the structure of the EU ETS cap can undermine its value in providing incentives for a reduction in emissions if financial conditions continue to change drastically like during the last financial crisis that ravaged Europe. In this study, I will use the term “carbon credit” for short, but under the EU ETS system, the tax applies to either the carbon content of fossil fuels before combustion or the CO2 in gases after combustion. It also applies to other greenhouse gases, such as methane from landfills, animals and coal seams. When emission trading schemes (ETS) were first created, their purpose was to realize carbon emission reduction targets proposed in the 1997 Kyoto Protocol and to address climate issues raised during the 2015 Paris Climate Summit. The EU ETS operates on the cap and trade standard. A cap is set on the entire amount of specific greenhouse gases, which can be released by installations covered by the system. Organizations obtain or purchase emission allowance within the cap, which they can trade with one another as required. However, they can purchase limited amounts of global credits from emission-saving schemes across the world. The objective of limitation on the total number of allowances available is to guarantee them a value. A company ought to surrender adequate allowances annually so as to cover all its extensions; otherwise, heavy penalties are imposed. A company can keep spare allowances to cover its prospective requirements or else sell them to another company that is short of allowances it is decreasing its emissions. Trading offers flexibility, which ensures that emissions are cut where it is not expensive to do so. Investment in clean, low-carbon technologies is also promoted by a robust carbon price. The default technique of allocating allowances is auctioning instead of free allocation, and harmonized allocation rules are applicable to the allowances still given away for free. It is comprised of more sectors and gases. About 300 million allowances are set aside in the New Entrants Reserves to fund the deployment of innovative renewable energy technologies and carbon capture and storage via the NER 300 program. Carbon dioxide from power and heat generation; commercial aviation; and energy-intensive industry sectors like oil refineries, steelworks, and production of iron, lime, acids and bulk organic chemicals. Nitrous oxide from production of nitric, adipic and glyoxylic acids. Membership in the EU ETS is obligatory for companies in these sectors, but in some sectors, companies of a specific size are included. Certain small installations can be excluded in case governments put in place fiscal or other measures, which will cut their emissions by an equal amount. The EU ETS was applicable in the aviation sector to flights between airports situated in the European Economic Area EEA alone until 2016. The EU ETS has confirmed that placing a price on carbon and trading in it can work. Emissions from installations in the scheme are reducing as indented- by approximately 5% in contrast to the start of the third phase. Emissions from covered sectors will be 21% lower in 2020 compared to 2005. They will be 43% lower in 2030 under the Commission’s proposal. The EU ETS is the first and the largest global emissions trading system in the world, accounting for three-quarters of global carbon trading. The EU ETS also encourages the growth of emissions trading in other nations and regions. The objective of EU is to connect the EU ETS with other compatible systems. The launch of EU ETS carbon system was first brought into the light back in 1992 following an agreement reached among 180 countries at the United Nations Framework Convention on Climate Change that sought to trim down the level of human-made global warming, particularly through carbon emissions. As part of adherence to the agreement, in 1997, the Kyoto Protocol (KP) was agreed upon that laid down the foundation for the establishment of the EU ETS based on two principles. The first principle entailed setting quantitative emission targets or limits for industrialized countries. The second principle provided a basis for flexible mechanisms, including options for exchange emissions units among nations. Since its first implementation, EU ETS has undergone four phases (see table 1). This section provides a detailed examination of the economic effects that emanate from the implementation of EU ETS Carbon System. The key focus is on the extent to which the policies contribute to a reduction in carbon emissions and strengthening of economic efficiency via its effects on prices. ETS guarantees environmental effectiveness as it targets emissions reductions. Proof from existing systems illustrates that ETS policy has driven emissions reductions, even when accounting for external factors. Approximates of emission reductions associated with the EU ETS vary from 3% of aggregate emissions to 10-18% at the firm level, with the effect on emissions being greatest during the beginning of the second phase (2008-2010). Modeling outcomes show that emissions would have been 24% higher for the RGGI states in the absence of an ETS. Same emissions reduction from baseline emissions has been attained under the Tokyo ETS- 23%; nonetheless, other factors also contribute to these results. ETS has also enabled clear emissions reduction paths. The quantity-based approach of ETS makes sure that emissions remain at or below the specified emissions cap throughout the covered sectors. Jurisdictions implementing ETS have targeted to adopt increasingly declining, credible caps in line with national climate targets, offering a clear emissions reduction path over the mid to long-term. In 2014, for instance, GHG emissions amounted to 1.812 billion an indication of a 4.5% drop from the previous year (refer to figure 1). The drop in GHG emissions was occasioned by an aggregate drop in cumulative emission surplus down to 2.07 billion in 2014 from 2.1 billion in 2013 following the implementation of the Backloading measure. In recent times, many companies in EU countries have embraced renewable sources of energy such as wind, tidal, biomass and solar energies. One study claims that these energy sources usually do not emit green gases into the atmosphere like convention sources of energy, which depends on fossil fuels. When processing such energy, turbines do not generate atmospheric emissions that result in greenhouse gasses or acid rain. Clean energy sources such as wind, tidal, biomass and solar energies are cost-effective energy sources to consumer (government, companies or individual) need only to acquire solar panels or technology or photovoltaics to generate electricity. Apart from their durability, energy efficient devices are often durable, cost-effective, and the user does not have to pay monthly bills. With no electricity bills to pay, individuals can save and use the money for other expenses. Therefore, the EU ETS carbon system economic sense since it is not only cost-effective but also promotes environmental conservation. However, the pace scale and speed with which companies are embracing alternative energy is slow and majorly depends on carbon prices. The continuous adoption of the ETS system among EU members has evidently improved environmental conservation through innovation and switch to environmentally friendly energy. Companies that have incurred the cost due to capping have had to look for ways to reduce their emission rates. In their endeavors, they have been forced to embrace innovation to conserve the environment. For instance, cement has been found to produce almost 8 percent of the European Union emissions coming both from consumption of fuel to support kilns and from chemical processes which changes limestone to clinker. 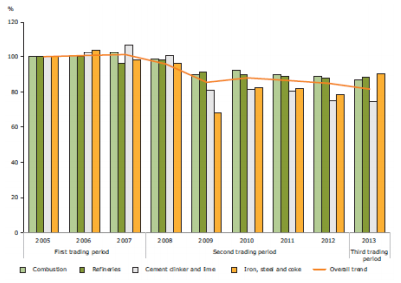 With a key focus on EU ETS, evidence suggests that the production of cement was not viewed to be having a considerable abatement opportunities but the situation has taken place through kilns changing towards the low-carbon fuels consisting of biomass and waste, and cement with low clinker rate being developed hence decreasing the emission arising from the product. Research further points out that as much as there has been short-term goal of switching from one fuel type to another, the intentional has been to promote innovation to low-carbon technologies and invest in efficient fuel assets and low carbon products. ETS delivers cost-effective abatement. For instance, studies have determined ETS as a highly cost-effective mitigation option in OECD countries. A recent OECD study established that in contrast to other instruments, ETS- and broad-base carbon taxes- incurred the lowest costs per ton of abated emissions. ETS offers flexibility because it permits companies to choose when and where to decrease emissions. The cheapest abatement options are picked first. Furthermore, participants can abate emissions when it is more cost-effective to do so. In addition, the price signal developed via an ETS automatically adapts to changing economic conditions, making emission reductions cheaper when the economy slows and more expensive in the period of growth. ETS facilitate low-carbon development, decoupling emissions from economic growth. It also facilitates the change to a low carbon economy and supports nations in breaking away from a carbon-intensive development path. Numerous jurisdictions with an ETS are already trending towards less carbon-intensive economies. For instance, emissions in California’s ETS were reduced by 0.6% whereas its GDP grew by over 2% during the first year of operation. The RGGI countries decreased carbon dioxide emissions from the power sector by more than 40% between 2005 and 2013; meanwhile, the regional economy grew by 8%. The analysis also indicates that during the first three years of operation, the RGGI program resulted in more than 16,000 new job years. ETS promotes the deployment and innovation of low-carbon technology. ETS establishes a carbon price, which changes market conditions to favor low-carbon production processes, products, and technologies, and provides an incentive for innovation. Evidence shows that ETS contributes to the deployment of market-ready low-carbon technology, as well as technological innovation close to the market. For example, research indicates that from 2005-2007, the EU ETS constituted the main driver for small-scale investments with short amortization times in covered firms in Germany. Studies also show that ETS is driving innovation. According to recent research, the EU ETS increased low carbon patenting of regulated firms by 10% compared to otherwise similar firms. In spite of its widespread application among EU members, the EU ETS carbon system has been criticized on a number of aspects that controversially causes some degree of market inefficiency among countries which ranges from loss of competitiveness leading to an increase in unemployment levels. Another major cause of economic inefficiency, particularly in the first phase of the EU ETS scheme, can be attributed to lack of simplicity, transparency, and harmonization in the EU Emissions Trading Scheme. This is largely due to the fact that the reduction obligations among EU members in Phase one failed to accurately reflect the burden sharing agreement of the scheme. In this case, the economic efficiency was weakened following the relaxation of reduction obligations without having in place a clear mechanism of ensuring reductions in non-trading sectors. Evidence suggests that since the scheme’s implementation in January 2005, firms in energy-intensive sectors have reported the massive loss of global competitiveness arising from increasing energy prices. The EU ETS carbon trading system was first implemented in 2005 as part of compliance with efforts to reduce carbon emissions in order to avoid further global warming. The EU ETS is primarily based on four phases that span from 2005-2028. Since its adoption, the EU ETS has contributed both to environmental effectiveness and economic efficiency. With regards to the later, evidence suggests that the underlying carbon systems have seen massive reductions in carbon emissions without harming other economic plays in member countries through the use of cost-effective techniques. Though, critics have indicated that the EU ETS has to some extent increased unemployment levels due to the loss of competitiveness in some member countries. This report has also provided a broad discussion of theoretical evidence on environmental benefit measured through emissions reduction using Emissions Trading Scheme. With the short existence of Emissions Trading Scheme, many benefits are yet to be discovered. Some of the benefits highlighted by this paper include controlled emission, investment, and planning benefits and conservation through innovation and low-carbon technologies. The paper has established that when greenhouse gas emissions are capped, it can help in controlling the level of pollution contributed by the industries. Capping of emission enables investors to effectively plan their environmental investments without having to worry about pollution. Lastly, the research found and concluded that the use of Emissions Trading Scheme has promoted environmental conservation through innovation of low-carbon technology. Alivernini, A., Barbati, A., Merlini, P., Carbone, F., & Corona, P. (2016). New forests and Kyoto Protocol carbon accounting: A case study in central Italy. Agriculture, Ecosystems & Environment, 218, 58-65. Ellerman, A. D., Marcantonini, C., & Zaklan, A. (2016). The European Union emissions trading system: ten years and counting. Review of Environmental Economics and Policy, 10(1), 89-107. Ellerman, A.D, Convery, F.J. & Perthuis, C. (2010). Pricing Carbon: The European Union Emissions Trading Scheme. Cambridge University Press, Cambridge. Page, T. (2013). Conservation and economic efficiency: an approach to materials policy. New York: Routledge. The World Bank. (2014). State and trends of carbon pricing 2014. State and trends of carbon pricing. Washington, DC: World Bank Group. Autism is a severe mental condition that often causes suffering from the early years of life. The condition results in challenges related with… .